A number of pellet manufacturers are included in a list of companies that will receive payments from the USDA to expand production and availability of both solid and liquid biofuels. With the construction start deadline of the end of this year looming for the Treasury Section 1603 Grants for Specified Energy Property in Lieu of Tax Credits program, the criteria for that specification is still not clear to many applicants. Presenters during a Sept. 28 webinar produced by the Biomass Thermal Energy Council and titled "Agricultural and Woody Biomass: Contrasts and Comparisons," provided a thorough review of the potential for using ag biomass for energy in the U.S. The Northern Maine Development Commission was awarded a $1.9 million grant to replace or supplement heating oil furnaces in businesses and homes with wood biomass units. An 8-megawatt anaerobic digester that would run on a mix of food processing waste including sweet corn silage and potato and bean waste is proposed for the southeast Minnesota town of Le Sueur. DP CleanTech will convert a coal-fired power plant in Thailand to run instead on waste wood and eucalyptus bark. The retrofitted combined-heat-and-power plant will provide 20 megawatts of electricity to a nearby bioethanol plant. 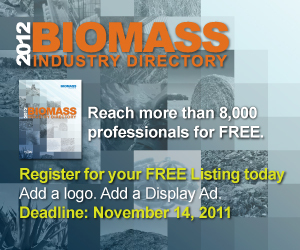 In an attempt to make New York a national leader in biomass research and development, the New York State Energy Research and Development Authority is requesting proposals to develop a biomass heating roadmap. U.S. EcoGen Polk LLC plans to construct and operate a 60-megawatt biomass plant in Fort Meade, Fla., that will use eucalyptus as a feedstock. At a cost of $200 million, developers expect construction to begin on the plant in early 2012. After just a few months of production, Cliffs Natural Resources Inc.'s biomass cube production facility in Michigan could close its doors, a result of the plant's performance not reaching design capacity and expected production levels.